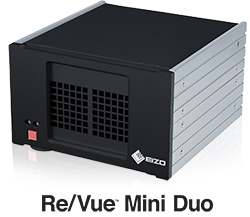 Altamonte Springs, Florida, USA, February 21, 2014 – EIZO today announced the Re/Vue Mini Duo, a dual-channel lossless video and audio recording solution with built-in mission-critical redundancy for air traffic control. The Re/Vue Mini Duo is designed to address the growing need for the synchronous recording and streaming of 8MP monitors in the ATC industry as well as support dual-4MP monitor workstations. The Re/Vue Mini Duo provides two-channel recording and streaming of resolutions up to 2048 × 2160 from digital (DVI-D) sources, supporting simultaneous recording of two 4MP monitors or a single 8MP monitor. Lossless video and audio recording maintains the quality of the original source data while high compression ratios of 8,000:1 to 20,000:1 minimizes required storage for large volume image data. The Re/Vue Mini Duo also offers frame rate configuration for acquiring the ideal balance between maintaining high image quality and reducing data size. The Re/Vue Mini Duo provides extensive redundancy to ensure continued operation through dual Ethernet outputs and two power supplies. Each of the video connectors is equipped with an integrated video splitter for forwarding video signals to the receiving monitor or monitors even when no power is applied to the unit. The Re/Vue Mini Duo is operating system independent and hardware agnostic so it can serve as a standalone recorder or be integrated into broader recording solutions. EIZO’s Re/Vue series of ATC recording and streaming solutions was first introduced five years ago and includes the Re/Vue MG1 and Re/Vue Mini video and audio recorders, and the Re/Vue Lite encoding and streaming device. With the addition of the Re/Vue Mini Duo synchronous recording solution, the series offers an extensive lineup for a wide range of mission-critical ATC environments.